Colona was carefully designed to achieve effective relief of gastro- intestinal spasms and colics specially when presenting as psychosomatic manifestationof nervous tension, mental stress,anxiety or other psychic states. 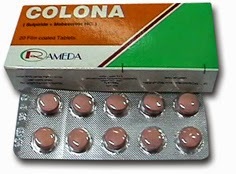 Colona contains Sulpiride which is a selective central dopamine 02 receptor blocker. It exerts a mood elevating effect (due to is neuroleptic effect) and anti-emetic action. anti-spasmodics with atropine like properties. Colon a is, therefore, an antispasmodic specially effective in functional gastro-intestinal disorders and is particularly safe in elderly group who might be suffering from prostatic enlargement. glaucoma. or cardiac problems.